The Mississippi River Delta and coastal Louisiana are disappearing at an astonishing rate: a football field of wetlands vanishes into open water every 100 minutes. Since the 1930s, Louisiana has lost over 2,000 square miles of land, an area roughly the size of Delaware. Many factors have contributed to this collapse. One of the most significant causes of land loss is the straitjacketing of the lower Mississippi River with huge levees to control the river and protect communities, economic infrastructure and other resources from river flooding. The problem is the delta’s wetlands were and still are built and sustained by sediment delivered by the river. Leveeing of the river cut the tie between the sediment-filled river and its delta, stopping the cycle of new wetland growth. Instead of being deposited in nearby wetlands and replenishing marshes, this sediment is completely wasted—lost out of the mouth of the river and deposited far into the Gulf of Mexico. Without land-building sediment from the river, the delta is doomed to continue shrinking, endangering people, wildlife and jobs in coastal Louisiana. The vast network of shipping channels along the coast allow salt water to penetrate deep into the wetlands, destroying the ecosystem that was built by fresh water. When waterways such as the Mississippi River Gulf Outlet (MRGO), Houma Navigational Canal and Freshwater Bayou Canal get built, they allow far more saltwater damage to occur. Louisiana is America’s energy coast. Thousands of offshore oil rigs and onshore wells dot the state’s coastline, including significant refinery capacity and thousands of miles of pipelines connecting it all. Over the decades, these activities have directly impacted thousands of acres of coastal wetlands and modified the coastal hydrology, speeding up land loss. Additionally, thousands of miles of oil and gas canals have been dug to accommodate energy infrastructure and extraction, altering the natural hydrology, disrupting the salinity balance and killing the vegetation of freshwater wetlands, causing them to subside underwater. Valuable land-building sediment is trapped behind locks and dams on the Missouri, Mississippi and Ohio Rivers. Since 1850, the amount of sediment in the Lower Mississippi River has decreased by more than 70 percent. Land formed by river sediments naturally subsides and sinks over time as part of the delta cycle. Historically, sediment deposition and increases in plant growth and land building outpaced the natural subsidence, resulting in coastal land gain. Without land-building deposits from the river, subsidence dominates and massive areas of land sink and disappear below sea level. Scientists say that the level of the world’s oceans will rise from one to three feet over the next century. Rising seas combined with subsiding land (called “relative sea level rise”) make the threat of submergence even greater for the Mississippi River Delta and coastal Louisiana. 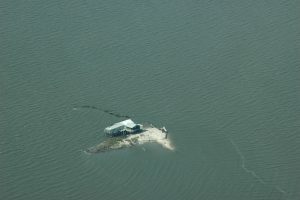 Storm surge from Hurricanes Katrina and Rita destroyed hundreds of square miles of coastal wetlands in a matter of days. The damage they wrought from flooding and storm surge was made worse by the previous loss of miles of protective wetlands. The continued loss of wetlands will make coastal communities such as New Orleans even more vulnerable to future storms and hurricanes. The BP Deepwater Horizon oil rig explosion led to the Macondo well spewing 206 million gallons of oil into the Gulf, damaging hundreds of miles of delicate shoreline and accelerating erosion. 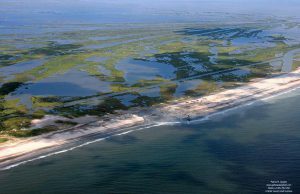 Thousands of acres of coastal marsh were damaged, and the communities, economy and wildlife of the Gulf Coast were disrupted. The spill’s long-term effects will continue to impact the coast and its inhabitants for decades to come. Though several harmful invasive species exist in coastal Louisiana, two stand out. Nutria are fast-breeding, voracious rodents that were introduced into Louisiana for the fur trade. But, their impact on coastal wetlands has been disastrous, as they eat the roots of wetland marsh plants and devour cypress seedlings. In recent years, feral hogs have also become a serious problem. Like nutria, they destroy wetlands through aggressive foraging.